Jen may be a die hard Indian takeaway fan, but she’s not afraid to experiment. So when I receive her request for some “real” Indian restaurants, I get ready to push the boat out. Most Indian restaurants in the UK are run by cooks from the Sylhet province in Bangladesh. Taffy explains it beautifully, so I won’t bother. Basically, the food is delicious but not Indian. It was created especially for the British beer and curry palate and is dished out by Bangladeshis. It’s hard to rank a top 5 because there are such different classes. At the cheaper end, many of the Brick Lane restaurants are still great value for money, but perhaps not such great value as they used to be. My local restaurant in Hackney’s Broadway market, Joy, is excellent value for money. I would say that, of course, I spent some time training there! I’m told that a brilliant restaurant is New Tayyab in Whitechapel. My friend who owns Joy and my mother both rate it very highly and want to take me there, but I’ve not been yet. It gets rave reviews. Moving up market, Cyrus Todiwala’s CafÃ© Spice Namaste in Aldgate nearby is also brilliant. I’ve also had the pleasure of working there. The food is excellent and the attention from Pervin Todiwala front of house makes you feel right at home. 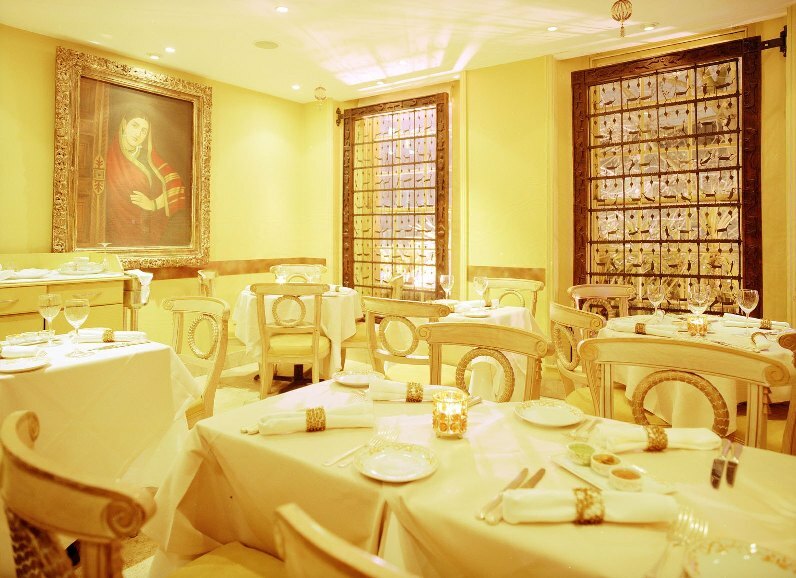 For a more traditional approach, you can’t avoid the restaurants of the Panjabi sister -, Veeraswami in Regent Street, Amaya in Knightsbridge and Chutney Mary in Chelsea. At the top end, I visited Tamarind in Mayfair for lunch the other week. The food was brilliant and the service probably the best I have ever experienced in my life. The other Michelin-starred Indian restaurant always getting mentioned is Rasoi Vineet Bhatia, but I’ve not tried it yet and I know it has received some mixed reviews. Sh*t. Now I’m going to have to rob a bank and try all of the above. Thanks for the suggestions Mallika – just read your reply. I tried Gaylord a couple of years ago on your recommendation – it was very different food to your usual English curry house but the food was fantastic. As for my favourite curry house, I’m looking for a new one as my old faithful (Shamrat of India in Crouch End) closed down over a year ago and despite trying out loads of other restuarants since, I’m still to find another one in North London that hits the spot. What about America? Is is true too that Vikas Khanna is the most famous Indian Chef in the World? I like your choice, many are mine fav too…. im sorry to say ive been all over uk to tryed so called indian cusine in chip shops,fast food outlets. I found your website when I was looking through some of the restaurants for research purposes and found that you have missed Cafe Spice Namaste near the Tower of London. Most innovative, fresh varied food and try and meet Cyrus & Pervin the husband and wife team who make the experience a treat. I cannot eat Indian food at any other restaurant now and do not forget to try their pickles. Ragam, on Cleveland Street it Fitzrovia (nearest tube probably Goodge St) is outstanding. The best Indian I’ve ever been too. It’s South Indian food, so lots of Dohsas and fish curries. It looks like your average, englishified curry house on the outside, but don’t let that put you off. It’s one of those places that’s so good you almost don’t want to tell everyone because then they’ll all start going there and then you might never get a table again. Ganapati, on Holly Grove in Peckham is also really stellar. I know, something has to be pretty good to get you to come to Peckham (unless you’ve actually been there before and you know that parts of Peckham are really lovely, and rather posh) but this place, also South Indian food, is really, really lovely. Just come back from there tonight actually, feeling rather full and fat. This is the initial time I have commented listed here and I need to say you give genuine, and quality facts for bloggers! Great position.